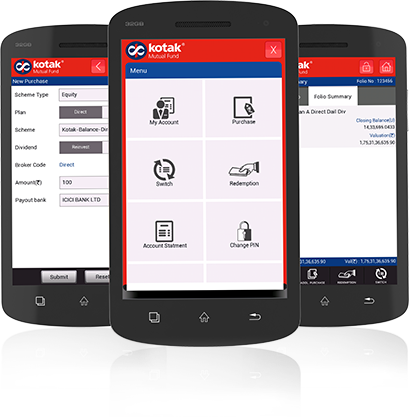 Manage your Kotak Accounts and Credit Cards with ease using Kotak Mahindra Bank’s official mobile banking application. 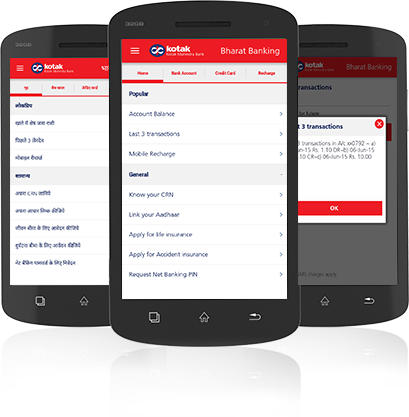 BHIM Kotakpay is UPI (Unified Payment Interface) based, bank agnostic payment app. This app will let customers send and receive money using UPI platform without displaying their account number. Kotak Bharat Banking helps you to do basic banking for your savings / current accounts and credit cards without requiring an internet connection. Smart Solutions Investment App- Decades of investing expertise at your fingertips It’s a one stop solution for Mutual Funds and access to investment solutions that suit your risk appetite. A click to accelerate for calculating guaranteed increasing second income, maturity benefit, tax benefits etc. It is a guaranteed income anticipated endowment insurance plan. 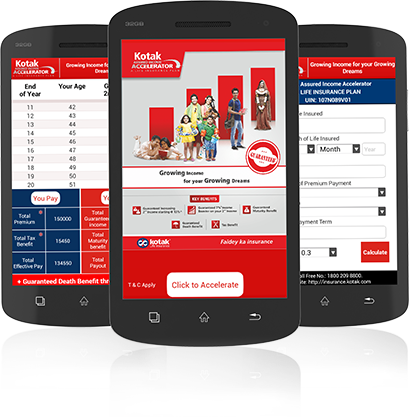 Kotak Mutual Fund Application for Convenient, Hassle Free & Quick access to Kotak Mutual Fund schemes. 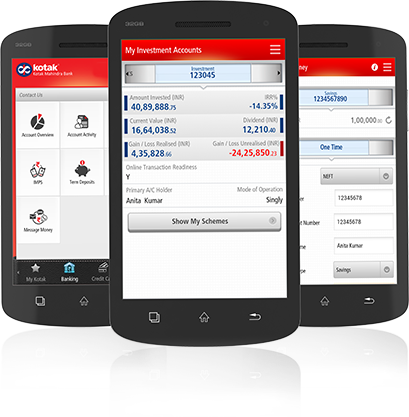 Kotak Mutual Fund Application allows you to transact on the move. 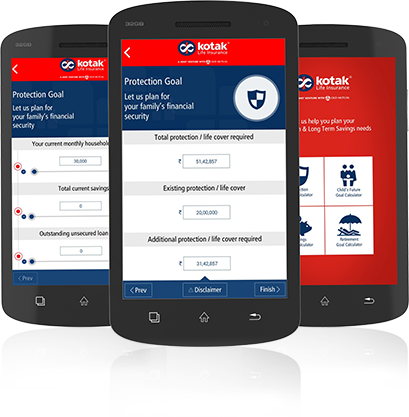 My Goal Calculator by Kotak Life Insurance, is simple & easy to use app to help you plan your Protection & Long Term Savings needs. 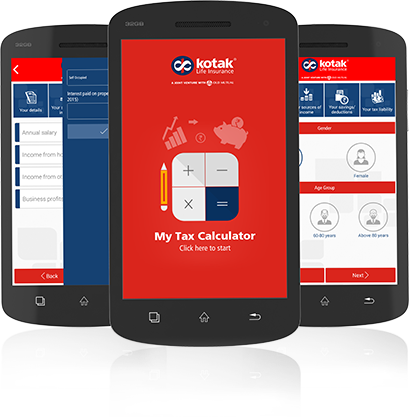 Kotak Life Insurance brings to you ‘My Tax Calculator’. It is a simple and easy to use application to calculate Indian resident’s tax liability for the financial year 2014-15. 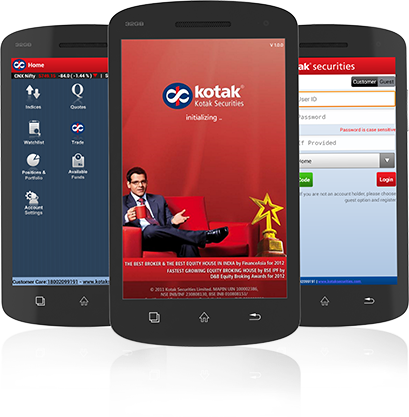 Kotak introduces Kotak Stock Trader app - a unique stock trading mobile based application that lets you trade, view latest quotes, track portfolio and market movements, analyse market trends, get live research calls, and do much more instantly.